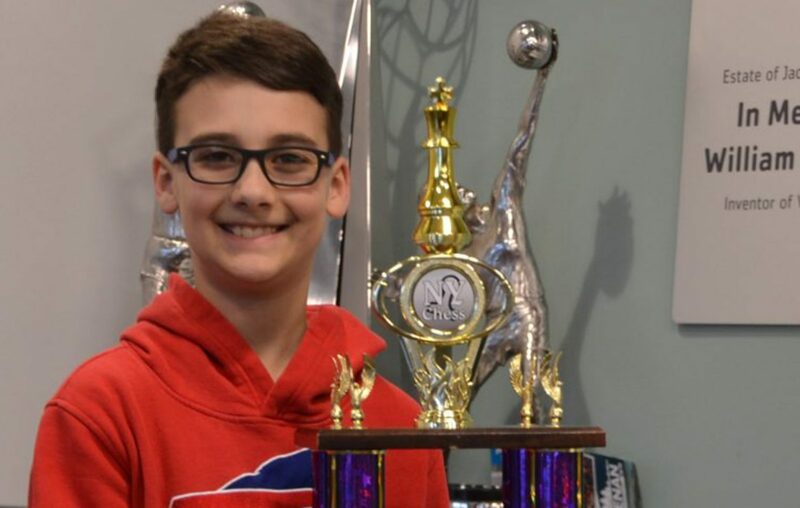 A Lockport fifth-grader who started playing chess at age 4 received his first trophy during undefeated play in state competition earlier this month in Saratoga Springs. JonLuke Pencille, 11, the son of Jeff and Lucy Pencille, told his teachers and classmates at Emmet Belknap Intermediate School that chess made him famous, said his coach Michael McDuffie. JonLuke finished first out of 128 competitors. He was accompanied by his teammates – Ryan Carmina, also of Emmet Belknap, and Jonathan Carmina and Tristan Perkins of North Park Junior High School. All learned chess through McDuffie at the Lockport YMCA Golden Knights National Scholastic Chess Team. JonLuke is the program’s third undefeated state championship. His extracurricular activities include playing soccer and trombone. McDuffie founded Archangel 8 Chess Academy in 1999 and routinely sponsors tournaments in the Main Place Mall.